It is true that Joli’s voice resembles his father’s voice. Dino Valenti, Joli’s dad, is known for authoring original “Get Together” song and heading the Quicksilver Messenger Service band of 1960’s musical fame. Joli Valenti, a great singer like his father, spreads a lot of energy and that energy is reflected by the band ‘behind’ him. 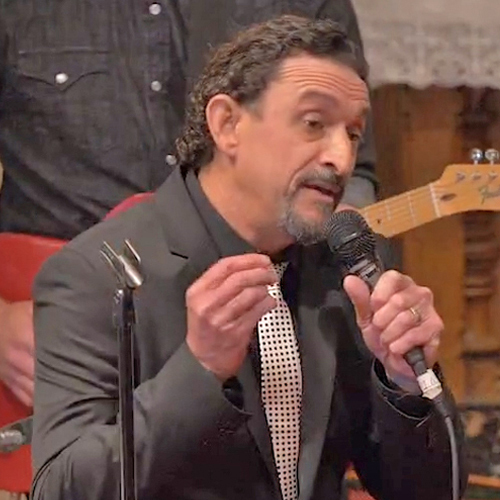 Now, at the 50th Anniversary of that most famous song, “Get Together“, which became a #5 hit of the Billboard Record charts for the Youngbloods, Joli brings a version of his father’s famous song. In a world filled with division and and taking sides, Joli reminds us, in song, that the solution remains the same – it is time for us to “Get Together” once again and remember the lesson contained in the lyrics of that great music. It is time to “Get Together” for Narada’s Great Gospel Show.